This is my pancake day recipe. I added blueberries and mushed tofu in the pancake butter for my diet, because I decided to eat a lot of pancakes today (it’s pancake day!). The pancakes are fluty and fluffy, not overly sweet and I love the fragrant of maple syrup. It was a great afternoon treat. Place the flour, baking powder, sugar and salt in a large bowl and whisk together. Mush the tofu in a separate bowl, add the egg and milk, whisk together. Add the flour mixture in the egg mixture, and whisk just until combined. Add the blueberry and gently mix with the butter. Heat the frying-pan, melt a little butter over low heat, pour the butter onto the pan spacing the pancake a few inches from each other. Cook them until the bottom of the pancakes are golden and bubbles start to appear on the top surfaces, then turn and cook another 3 minute until golden. Repeat with remaining batter. 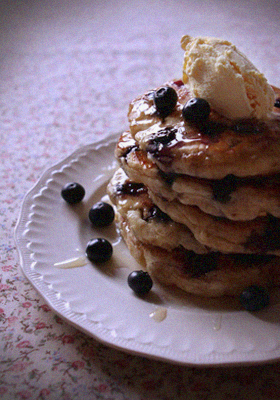 Serve with the maple syrup, garnish with the rest of blueberry and vanilla ice cream. Hi Misa, hello from California. My name is Mario and I wanted to thank you for adding me as a friend on the UK Foodbloggers. First let me say that I hope all is well with your family and friends in Japan. My wishes and prayers go out to them and you. I wanted to visit your blog. You have awesome photos and your Miso Duck with Mango Bruschetta looks so yum! I write a blog on people and relationships through stories about Food and Recipes. Sometimes vice versa. Please visit. And maybe Follow. That would be cool. Thanks so much. You are currently reading Tofu and Blueberry Pancakes at Fish Trip Cafe.